Taxonomy of Australian Mammals utilizes the latest morphometric and genetic research to develop the most up-to-date and comprehensive revision of the taxonomy of Australian mammals undertaken to date. It proposes significant changes to the higher ranks of a number of groups and recognizes several genera and species that have only very recently been identified as distinct. 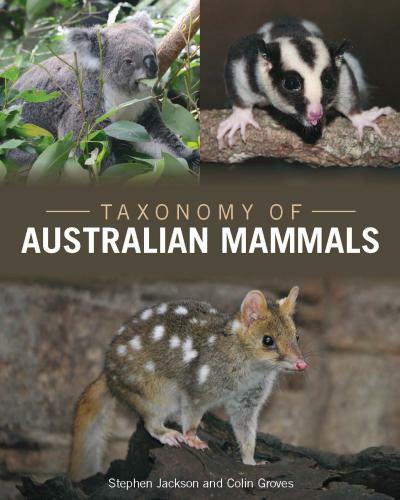 This easy-to-use reference also includes a complete listing of all species, subspecies and synonyms for all of Australia’s mammals, both native and introduced as well as terrestrial and marine. Despite the production of various excellent books on Australian mammals over the last few decades there is no current comprehensive checklist that provides a full list of scientific names and a list of agreed common names – indeed, there is no formal system for setting up an agreed list of common names. The rate at which species of the different orders of Australian mammals have been described by science has varied considerably over time. Some groups such as the monotremes, bandicoots, seals, and exotic species were all described by 1900, while other groups such as the diprotodontians, chiropterans, rodents and dasyurids have continued to steadily increase in number in the last 30 years. Given the current knowledge of the taxonomy of Australian mammals it is clear that groups such as the dasyurids, chiropterans, rodents and the cetaceans will continue to reveal further species well into the future. Therefore an effort has been made here to set and follow several rules in the formation of common names. With respect to higher taxonomic ranks, the absence of an updated checklist in Walton (1988a) has resulted in some authors such as Van Dyck and Strahan (2008) perforce retaining a somewhat outdated higher taxonomy, while Menkhorst and Knight (2011) included only the families within each order without any further division. Therefore an exhaustive effort has been made to include all higher ranks and their associated synonyms.